Imagine this scenario: You arrive at the airport, on your way to see relatives for the holiday season. You have already bought and packed presents for each family member, when panic strikes. You have forgotten someone. You remember the stray facts from half-remembered phone conversations with loved ones this last year. Your sister had triplets; your cousin returned from the Peace Corps; your estranged uncle has been welcomed back for Christmas; grandma has a new boyfriend that she’s introducing to the family. Did you know that first pressings of new Sub Pop LPs are usually done on colored vinyl? We call this the “Loser Edition,” and the airport store always has a steady supply of the newest releases. 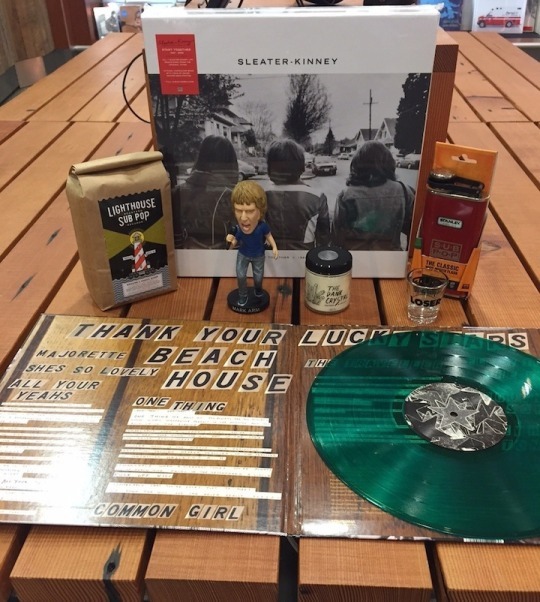 You could take home Beach House’s Thank Your Lucky Stars (ultra rare glitter vinyl AND green vinyl), Deaf Wish’s Pain (clear with black), Flake Music’s When You Land Here, It’s Time to Return (orange vinyl), and/or many other varieties for people with differing musical/color tastes. Just look for the gold ‘Loser’ sticker on the front of each LP. Are you tired of scanning the resale market for last year’s Sleater-Kinney box set, Start Together? After thinking we sold out of box sets last winter, we stumbled upon a few more in a supply closet. Are we the last brick n’ mortar store in the world to have these in stock? Possibly. Do you want the hottest box set from last year, for this year? Here is your chance! We also still have a few Deluxe editions of this year’s superb No Cities to Love LP if you want to go all out and complete the discography. Now that I’m an adult, I’ve learned an important secret about the holidays: they are primarily made tolerable by alcohol. With that in mind, the airport store has plenty of options for you and your lushy-loved ones. Might you consider a Sub Pop branded Stanley flask, so your aunt can always have a supply of peppermint schnapps? And what about later, when you and your siblings want to do shots after dinner talk turns political? There are the always fashionable “Loser” and “Winner” shot glasses in-stock at the store. And why not plan ahead for the morning after, when you’ll need copious amounts of caffeine to feel human again? We also have our own Sub Pop roast of Lighthouse Coffee available for purchase. What’s a perfect gift for the Mudhoney-loving family member who has everything? We suggest purchasing the brand new Mark Arm bobblehead, er, I mean, ‘throbblehead.’ Who doesn’t want a little buddy to rock out with when you’re spinning all those classic records? Are you unsure about what to get your quiet relative, the one who usually spends the whole holiday party holed up in his or her room? The airport store is proud to carry Dank Crystal candles in many different scents, each designed to enhance the aura of every room and delicately cover up even the dankest of odors. But what makes the Dank Crystal unique in the crowded candle market? Well, aside from being handmade by Sub Pop’s own Bekah Zietz, each candle has its own purified crystal inside. A Dank Crystal is the perfect present for ensuring some calm and relaxing vibes to conclude the year. This just represents a small sample of gift ideas you’ll find at the store. We also have countless other items for the Christmas, late-Hanukkah, and Kwanzaa gift-giving season. So, remember to give yourself extra time at the airport for these next few weeks and stop by the Sub Pop airport store. Sales associates are standing by, eager to help all you slackers find the perfect last-minute present.